Black Spot Affecting Your Roses? Black spot fungus on roses. 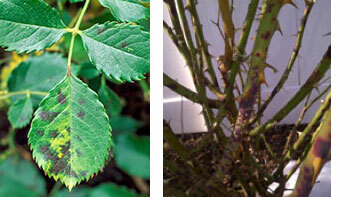 Black spot is one of the most common diseases of roses. It is caused by the fungus Diplocarpon rosae. As the name implies, infected leaves will show black spots which are tiny lesions generally on the upper surface of the leaves. The lesions, which can be up to ½ inch in diameter, slowly enlarge over several weeks into circular black spots with irregular fringed margins. The leaf tissues often turn yellow around these spots, which is usually a sign that the leaf will soon drop. Small purplish-red (later becoming black in color) lesions may also form on the first-year stems and existing canes. Blotches on the canes are the primary source of infection as new leaves emerge in the spring. Cycle starts in the spring. In spring, black spot emerges when the ideal conditions for spore growth occurs – warm, wet weather – with the optimal developmental temperature of 68 degrees. Spore growth occurs on infected fallen leaves and canes that have overwintered in the garden. Spores can germinate and infect the plant in just one day, cause symptoms within 4 to 5 days which in turn produces new spores that can infect additional leaves, flowers, and canes within 10 to 11 days. Spores are easily moved by air currents which can spread the disease quickly. Long-term effects. Black spot can cause complete defoliation by early fall, resulting in a weakened shrub on which cane dieback and cankers become severe. Eventually, the disease causes reductions in flower quantity and quality, and failures in grafting or budding. Plants plagued with black spot will be more susceptible to winter injury, drought and damage from insects. Without intervention, the plant can die. How to manage. If roses are checked regularly and the infected foliage is removed immediately, there is a good chance of keeping black spot under control. During periods of prolonged wet and warm weather, black spots may become severe. No infection occurs if the foliage remains dry or if the humidity is below 95%. Sanitation – Remove and dispose of black spot infested leaves including those that have fallen as frequently as possible. Do not compost infected foliage. At the end of the season, rake and dispose of old leaves or remove before bud break in the spring. In late winter, prune out infected canes until a clean and healthy stem interior is located. Prune close to a bud union to greatly reduce the carryover of the fungus. In early spring, remove any remaining foliage found in the garden. To reduce future occurrences of black spot, remove the top inch of soil and replace the mulch surrounding your roses every spring. Keep foliage dry – Avoid overhead irrigation. Water in the early morning and avoid watering on cloudy days or during late afternoon and evening hours. Keep the soil evenly moist 8 to 12 inches deep. Promote good air circulation by pruning roses to open them up and by spacing them properly as required of the cultivar. Plant them away from solid wall surfaces such as a garage or air-tight fence. Disease resistance – Select only top-quality cultivars with resistance to black spot, keeping in mind that resistance may vary due to the strain of the fungus. Proper planting practices are essential to maintaining good plant health. Plant in well-drained soil that is high in organic matter and where the shrub will get at least 6 hours of sun. Avoid planting near large shrubs or trees that will compete for moisture, light and soil nutrients. Preventative fungicide applications – In order to be effective, fungicide needs to be applied preventively so that it will provide a protective barrier and kill the germinating spores that have landed on the uninfected leaves. Fungicide applications need to be started as new leaves appear in the spring, ideally before it rains. The applications should continue throughout the summer. Spray needs to be applied to both the top and bottom leaf surfaces to the point that it drips off the leaves. The frequency of application is dependent upon the weather – up to every 7-10 days during wet, humid weather. During dry weather, spraying may be suspended for longer intervals. Several retail fungicides are sold for the control of black spot. We recommend that you select an organic product if you’re going to use one. You’ll also find recipes on line for several home remedies but their effectiveness is undetermined. Any spraying should be done in conjunction with proper sanitation to control black spot.